"Throughout her storied and impactful career, Iyanla Vanzant has gifted the world with her unique solutions to universal problems," said Mike Mills, President of Mills Entertainment. "We are excited to once again partner with Iyanla to launch another highly-successful expansion of Iyanla Vanzant's brand into the live space." Best known for her eponymous hit talk show, best-selling books and audios, and her numerous appearances on The Oprah Winfrey Show, Iyanla is the host and executive producer of "Iyanla: Fix My Life", the number one unscripted show on OWN: Oprah Winfrey Network (#1 original series on all of TV broadcast and cable among African American Women 25-54 and Women 18+). "People often ask me - what is faith?" says Iyanla. "Faith is not believing, trying, or hoping. Faith is the internal knowing that motivates you to act! Faith produces doers who are obedient to their inner voice. Faith builds the endurance we need to face life’s trials. Today, it's not enough to read and reflect. That's why I'm doing the Acts of Faith Remix Tour to challenge us to go forth and become 'faith-in-action' world-changers." A schedule of tour cities and dates can be found at www.IyanlaVanzantLive.com. 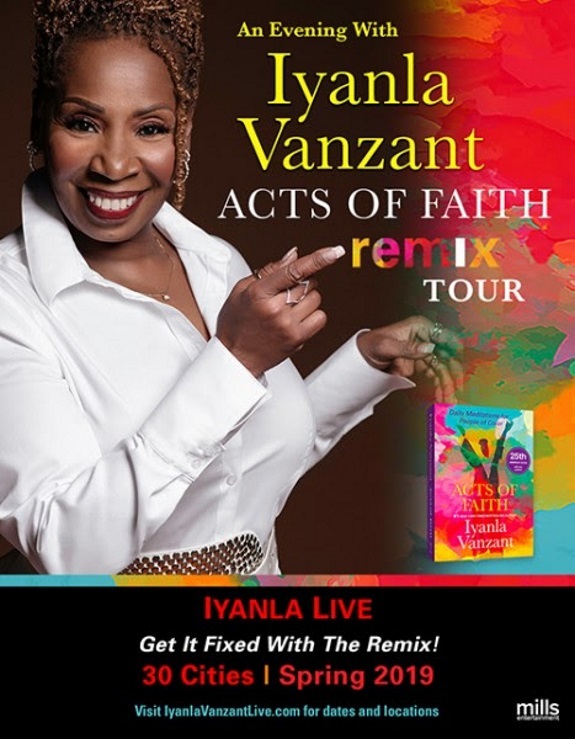 Tickets and VIP packages, including a copy of Iyanla's 25th Anniversary edition of Acts of Faith, go on sale on February 1st at 10:00 a.m. local time at www.IyanlaVanzantLive.com. Acts of Faith: Daily Meditations for People of Color is published by Simon & Schuster and is available for purchase at all booksellers. Iyanla Vanzant is the host and executive producer of OWN's acclaimed and award-winning series, "Iyanla: Fix My Life." She is one of the country's most celebrated writers, public speakers, and among the most influential, socially engaged, and acclaimed spiritual life coaches of our time. Dedicated to facilitating the growth and evolution of human consciousness, Iyanla's body of work spans over three decades and includes 18 published books, 6 New York Times best-sellers (translated into 23 languages and with sales exceeding twelve million copies), CDs, television, radio and stage performances. Her most recent book, the 25th anniversary edition of Acts of Faith is a celebrated international classic. When not writing or appearing on television, Iyanla lectures and facilitates workshops nationally and internationally. With her no-nonsense approach and underlying message of, "live better by loving yourself," Iyanla has ignited a universal flame of personal transformation.